Sometimes it can be tough to tell the difference between an accident and art. 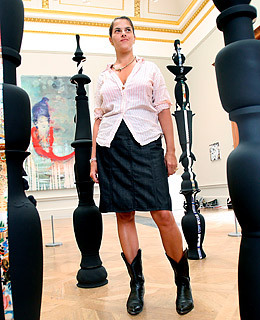 That was the lesson learned when a visitor at London's Royal Academy stumbled into the 9-ft.-tall ceramic sculpture at the heart of a 2008 exhibition by Costa Rican artist Tatiana Echeverri Fernandez. Initially, an eyewitness reported, museumgoers seemed to think the hundreds of pieces of broken pottery were part of the exhibition. "They were taking pictures," said the witness, Claire San Martin, at the time. "It was quite funny." Fernandez likely thought otherwise.